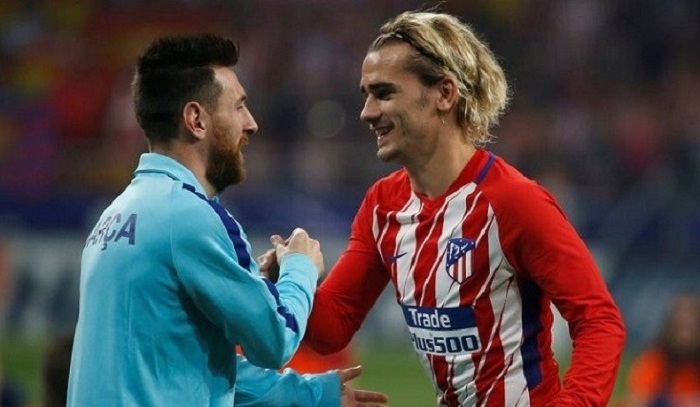 Lionel Messi would welcome the addition of Antoine Griezmann to Barcelona's ranks as the France forward prepares to reveal where he will plying his trade next season. Griezmann's future has been the source of much speculation over the past 12 months and, after last summer being heavily linked with Manchester United, he has emerged as a possible big-money signing for La Liga champions Barca. The 27-year-old, who could also decide to shun any suitors and extend his four-year stay with Atletico Madrid, is set to announce his intentions before France begin their World Cup campaign against Australia next Saturday. Should he decide the Nou Camp is his next destination, Messi believes the prolific striker's signature will help Barca's bid to reclaim their former mantle as Europe's top team from Real Madrid. Asked if Griezmann is the top summer target Barca need, Messi told Spanish newspaper Sport: "I don't know if he's a priority. "I'm in agreement that to get back to winning the Champions League we have to have the best players. And Griezmann is one of them. If the club sign him, brilliant. "I don't know if he's the priority. It depends on the technical secretary and coach. I'm just saying that to win the Champions League you need to have the best. And he is very good!" Messi won the Champions League four times with Barca between 2006 and 2015 but has seen arch-rivals Madrid claim it in four of the last five seasons. The Argentine, whose side were surprisingly dumped out of last season's competition at the quarter-final stage by Roma despite winning the first leg 4-1, added: "The truth is we would like to have won more Champions Leagues, above all in the last three years. "Getting knocked out at that stage of the competition can't happen to us, especially how it happened this time, with the first-leg lead we had. "That made the elimination even more painful and it was viewed as being even worse because of how it happened."